Home Internet News DOST strengthens R&D capabilities with IBM Blue Gene Supercomputer! DOST strengthens R&D capabilities with IBM Blue Gene Supercomputer! Last May 16, 2013, the Department of Science and Technology (DOST), the University of the Philippines (UP) and IBM announced, that the world-renowned IBM Blue Gene supercomputer has been chosen to support the Philippine government’s priority R&D projects focused on reducing poverty, improving government processes and tools and enabling smarter weather management, as based on the National Economic Development Authority’s Medium Term Development Plan. A milestone among government-private-academe endeavors, the supercomputer soon to arrive in the country will provide high performance computing capabilities to help develop practical solutions to address the country’s basic problems. 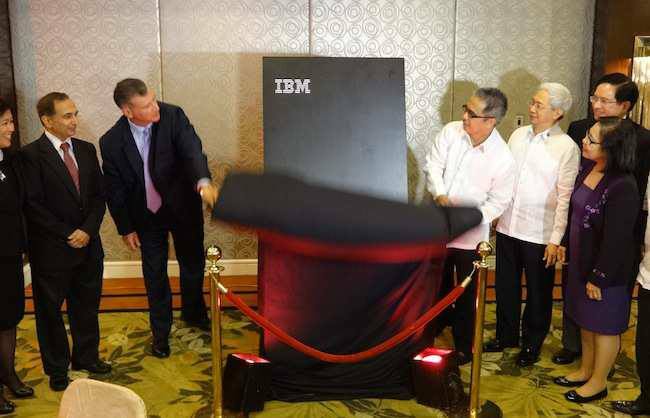 The IBM Blue Gene supercomputer is set to be the platform for select R&D projects that are aligned with the country’s strategic growth initiative to advance poverty alleviation; transparency in the government; rapid, inclusive and sustained economic growth; peace and order and environment and climate change mitigation. A priority R&D project, the DOST and IBM will collaborate on how the supercomputer can complement DOST’s Nationwide Operational Assessment of Hazards or Project NOAH, the government’s flagship program and integrated information system for disaster mitigation and climate change. The IBM supercomputer will enable local scientists to process and gain insights from the massive data collected, to produce faster, more accurate forecasts and improve localized weather prediction for the country. Prone to natural disasters, the country will benefit greatly once this projected is completed, as citizens and various government agencies can better prepare and plan what to do and what emergency response programs to activate, if and when a weather-related disaster occurs. “Smart Agriculture, the newest flagship program of the DOST, will also gain from our newest supercomputing capability in modeling climate change scenarios, building database for agricultural land use, and computing for monthly irrigation requirements per province,” Sec. Montejo added. Other possible projects to be aided by the IBM Blue Gene supercomputer include flood management and genomics.